Like the first book the central theme remains the constant political warfare between Tony Blair and Gordon Brown, and how that impacted the governing of the Labor government. Of course the events they were dealing with in the second and third terms included Blair’s politically misguided Iraq war decisions, which the author covers in detail. That detail is not kind to Prime Minister Blair, nor should it be. Gordon Brown does not fare much better, and is shown in the worst light, both as a Chancellor constantly trying to push Blair towards the exit, and as the Prime Minister when he finally got Blair to go. Rawnsley, Andrew. The End of the Party (p. 288). Penguin Books Ltd. Kindle Edition. Rawnsley, Andrew. The End of the Party (p. 289). Penguin Books Ltd. Kindle Edition. The author covers the Iraq debacle at some length, and shows what I have always believed to be Blair’s true motivation: his desire to maintain the “special relationship” with the U.S., at all costs, and to be the “bridge” between Europe and George W. Bush. Blair believed he could influence the Bush Administration Iraq policy by proximity to the President, but his hopes in that regard were dashed by Bush (and Cheney and Rumsfeld.) The power in that relationship was obviously disproportionately in Bush’s favor, but the author speculates that Bush, as always, was underestimated politically by the British. Rawnsley, Andrew. The End of the Party (pp. 95-96). Penguin Books Ltd. Kindle Edition. 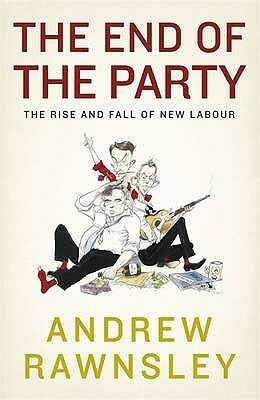 Rawnsley, Andrew. The End of the Party (p. 524). Penguin Books Ltd. Kindle Edition. Brown ended up losing to a Conservative Leader who seemed to emulate Tony Blair, David Cameron. He seemed, after the fact, and maybe a little before the fact, to become aware of some of his own shortcomings as P.M. Brown was, and is, a very smart man, but he spent a career trying to push Tony Blair out of the P.M. job. When he finally got the crown he found that the job was a little harder than he thought. Some real irony in the fact that Brown, as P.M., had trouble with a Chancellor who would not buy into his program. I am sure Tony Blair found that irony more than a little satisfying. Great book, highly recommended. Sign into Goodreads to see if any of your friends have read The End of the Party.